Fictional languages are languages created from scratch for the sole purpose of being integrated into a book or a movie. The fact that some authors go to the length of creating whole new languages says a lot about their dedication to the rendering of the fictions. In the first decade of the 20th century, Marcel Proust didn't invent a tongue but a sonate, Vinteuil's sonate. He wrote about it in his famous book In Search of Lost Time. The right, profound expression of the feelings of one of his personages depended on the invention of this musical masterpiece. Proust didn't need to go to the extent of really creating the sonate though. His fictional music didn't – still doesn't of course – need to be heard, nor even its score to be read by his readers for them to imagine the harmonical sounds. 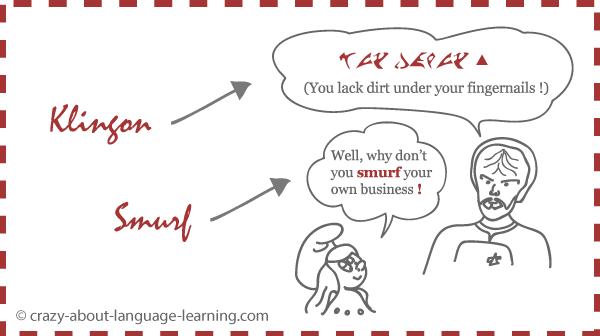 The simplest of all fictional languages ever invented is the Smurf, no question about that. But, there are much more elaborate ones. Klingon for example, a language that was created to be used by some of the characters of the Star Trek movies, can now even be found in the Translator tool of Bing among other very real languages. Marc Okran, a linguist from the United States, was asked to devise this language. He started by figuring out what it would sound like. He already knew the names of Klingon personages that were used in the series, so he used the sounds of those names and added a few others. Then Okran came up with the necessary grammatical rules. His main idea was that, being a non-human language, Klingon should differ as much as possible from human languages. He thus for example chose the Object-Verb-Subject word order which is the word order the least used by human languages. His third task was to invent the vocabulary of the script. You can watch Marc Okran explaining all this process in more detail in this video. The philologist** John Ronald Reuel Tolkien (1892-1973; and yes, sometimes you definitely need to be the owner of a long name to achieve great things) was a specialist in Germanic tongues and wrote among other fantasy texts The Hobbit and The Lord of the Rings, well known today for their adaptations on the big screen. He created not one but several languages that he drew out from the same (also invented) Old Elvish language family. The two most complete of his Elvish languages are the Quenya and the Sindarin. Quite a few other fictional languages exist and are still undergoing transformation by their inventors or their fans. If you are this kind of person who doesn't like to go with the crowd and is anyway looking for extra-ordinary encounters and nothing else, then you definitely have to learn one of those invented languages. You will then be able to try it out on the strangers you meet and, one beautiful day, you will for sure eventually stumble upon your linguistic soulmate. * A big ‘thank you’ to @plqaD on Twitter who corrected my Klingon !